I keep singing “On the Road Again” and “Leaving On a Jet Plane” on a loop in my head. We have been on the road for 23 days now. 18 more until we are back in the USA. We are more than half way done with gypsy life, so I decided to take a break from my diary/journal type posts and reflect a bit about this traveling life. It’s different. It truly is a different experience from what we did the first 4 months. 2 months of moving around is different than I expected. I’ve learned a lot. We all keep getting tougher. The road hasn’t broken us yet. Still going (relatively) strong. Knock on wood. As a teacher and mom of 3, I have built up a good amount of patience over the years. This trip has made me patient on a whole new level. I saw a quote recently about how we, as the adults, need to be the calm when our kids are feeling chaos. Or something like that. I suppose I could look it up, but you know what I mean. My dear, wise friend back home refers to it as not getting on their roller coaster. These are the words of wisdom helping me be successful on this journey. The grown ups have (mostly) remained calm and OFF the roller coaster. We are setting the tone for our travels. I know I mentioned this in a different blog post, but for me it’s about positive energy. If someone is having a bad day or a bad hour or a bad moment, we just let them. Then we try not to let it bring us all down. That’s the goal. Collectively, we are only as happy as our happiest teammate! Can’t be the other way around. This has been a valuable life lesson. Traveling with 3 young people is wild. So many emotions and needs and everything. Everything. It’s a lot. I said this is another blog post once about when parents on Facebook were complaining about being stuck home for ONE snow day with their kids. I LOL and LOL about that. The five of us are “stuck” together for 6 months. We aren’t just living in another country or traveling abroad. It’s more than that. We are in it. Together. Like always together. I can’t stress this enough. We don’t separate. No need to send help….we are finding our groove. Adpating and wearing our positive pants (most days.) I won’t say it’s easy, but it’s now our new normal, so we have worked out many of the kinks and are making the best of it. But it’s wild. We definitely miss being with humans other than each other. For sure. But I also know that before we know it, we will be back In Denver all going our separate ways again. I hope not in the same way as we did before. I hope this trip gives us some connections that will continue long after we get home. It’s a hope I have and something I will also actively work on when we get home. But we are generally social people, so this is one hard part about traveling. Accommodations: We’ve been lucky. We picked places to stay back in May and we’ve been happy everywhere. Most are Airbnbs and just a couple hotels. Hotels here are more like apartments. Every place we’ve stayed has had a kitchen and laundry. That was a priority. Eating out isn’t something we do on a regular basis, so a kitchen was a priority. I prefer to eat meals at home and go out for a coffee or a treat. It’s too $$$$ for 5 of us to eat out, so we do it sparingly when necessary. Planning. I was talking to a Sydney friend about how I used to be a planner before this trip. Which sounded funny because this trip takes constant planning. She explained it as “flexible planning” and that seems about right. We plan the big stuff and let the small stuff happen. Both are great. There are 3 levels of activities during our time at all these different places. Level 1: The BIG ticket items, like the Great Barrier Reef or Australia Zoo. These outings take some pre planning/booking/organizing. These are big days out where we spend money on experiences, leave early, and pack a lunch. Level 2: These are my favorite. The rainforest or driving on the beach are examples. These days don’t cost much money ($7 for a car ferry) and aren’t subject to any particular schedule. We just take off and explore…enjoy the day with no specific expectations. These are the days where we, Marshalls, tend to thrive. No pressure. On our own time. Level 3: Days when we all need to chill. A swim in the pool if we have one. A walk. Movies and books and Legos and magic tricks. Sometimes a sick day. So we balance our trips with a mix of these activity levels. We got into a groove where we would show up at a new place. Kids would run around fighting over beds and declare it the nicest place ever. They loved “move in” days. They would check out the important things: pool and wifi. I would check about the coffee situation in the kitchen. Next, we would load up on groceries. Then we would crash from a day of travel. The next day we usually leave free to get our bearings. I would start with a master list of all the “must dos” in that particular part of Oz. Then I’d check the weather and loosely plan which days would be best for which activity. I’d research nature walks, beaches, wildlife and the best coffee. I’d set up a meeting with Wes to discuss and then we did the best we could each day to make it happen. We had to pace ourselves and I think we’ve done a good job at that. Of course, Wes is super sick as I say this, but it’s true. We are not touristing 24/7. We would burn out and be miserable. It’s working. What we are doing is working. We are seeing amazing parts of the country, having cool experiences, having fun and haven’t killed each other. Success. Recently, my Shelly asked me how the “mood” was and that gave me the idea for this post. Traveling is fun. We are in relatively good spirits. It’s going fast. So fast. The kids are definitely getting excited for Cape Cod! Mood: Mae lost her 4th tooth and is silly as ever. Luke needs a haircut and is currently obsessed with claw machines. 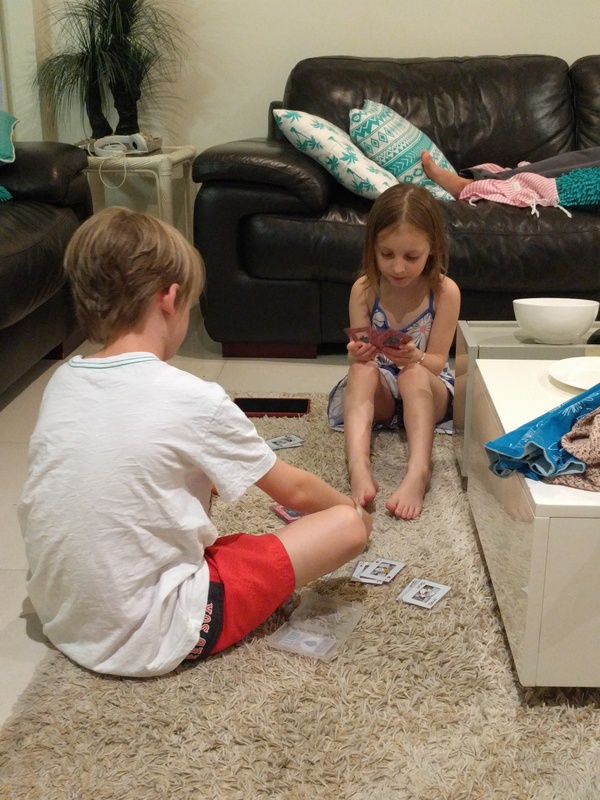 Elle has been perfecting card tricks, has been very helpful, and is excited to see her friends back home. Wes is busy getting work done for his Brisbane conference and constantly pulling over to take pictures of streets. Debbie has hit professional level of packing/unpacking. She’s also reading, exercising and trying to eat less sandwiches. All things considered, I’d say the mood is pretty darn good.